Democratic leaders late Sunday evening vowed to derail a vote on a package of pro-Israel bills despite those measures having received broad bipartisan support in previous Congresses, essentially ensuring the partial government shutdown continues. 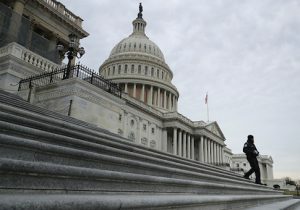 The 17-day shutdown continued this week after top Democrats declared late in the weekend no deal had been reached, but Congress has remained funded and is not part of the partial shutdown. With Congress open, top GOP Senate leaders had scheduled a vote Tuesday to move forward on what congressional insiders describe as a "mega" pro-Israel bill, including measures addressing Israel and Jordan's security and addressing boycotts of Israel, amid uncertainty generated by the Trump administration's new policy to withdraw U.S. forces from Syria. Top Democrats signaled Sunday they would not allow consideration of the legislation. Sens. Chris Van Hollen (D., Md. ), Ben Cardin (D., Md. ), and Bernie Sanders (I., Vt.) all came out against a vote on the pro-Israel legislation. The opposition comes amid a new class of Democrats in Congress fiercely opposed to Israel and the Jewish people. The national security bill is a closely watched barometer among the pro-Israel community, as it will force newly elected members to stake out a clear position on support for Israel and U.S. national security priorities in the region. Democratic leaders are fearful of putting their new class of members on the record, sources said, particularly in light of a newfound support in Congress for the Israel boycott movement. In addition to providing funding for key pro-Israel priorities, the bill also addresses a Jordan defense cooperation measure, as well as sanctions on Syria and a separate measure to combat the Boycott, Sanctions, and Divestment movement, or BDS, an anti-Israel moves that wages economic boycotts on the Jewish state and its people. Top GOP leaders in the Senate are said to have taken control of the measures amid uncertainty in the Trump administration's newly announced policy to withdraw U.S. forces from Syria. Senate Leader Mitch McConnell (R., Ky.) invoked a procedural method to expedite consideration of the bill and move it straight to a vote on the floor. "It's absurd that the first bill during the shutdown is legislation which punishes Americans who exercise their constitutional right to engage in political activity," Sanders said in a tweet, referring to the bill that would oppose the BDS movement. "Democrats must block consideration of any bills that don't reopen the government. Let's get our priorities right." One senior congressional official familiar with backroom dealings taking place over the weekend, expressed confusion as to why Democrats would seek to block national security measures, and in doing so, prolong the federal shutdown. "Democrats should be all over this thing. These are bills Rand Paul tried to block, so they could talk about divisions on our side," the source said. "It's about bolstering allies endangered around Syria, so they could use it to hit Trump for withdrawing troops. And it's pro-Israel without having anything to do with the peace process, so they get easy votes. But their progressive base hates Israel so much these are apparently tough votes they want to avoid."